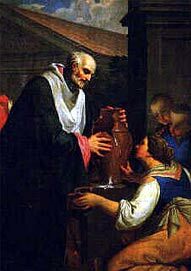 John Cantius, (1390 – 1473), Polish, brilliant student, Priest and Professor of Theology. John was a serious, humble man, generous to a fault with the poor, sleeping little, eating no meat and little of anything else. He made one pilgrimage to Jerusalem and four pilgrimages to Rome, carrying his luggage on his back. He is patron of Poland and Lithuania.